Imagine being part of a community practicing nonviolence together, living interdependently with the earth, and supporting people of all ages from all around the world to experience mindfulness and Nonviolent Communication in action. 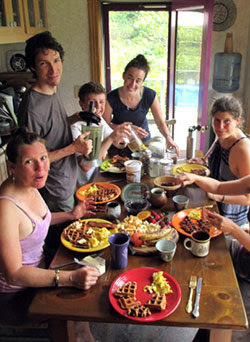 Imagine waking up to wilderness right outside your door, taking a drink of fresh spring water from the land, having a breakfast of organic food that you helped grow, and joining others for a standing meditation in the morning sun, before getting to your tasks for the day on the farm. Now imagine, you could actually live that life starting this June! We are excited to announce an opening for an intern, or an intern couple, to join us here at Wild! Heart Farm & Refuge, starting in June. This is a unique opportunity to live, learn, work, and play at the intersection of mindfulness, Nonviolent Communication, social and environmental justice, wilderness, and organic farming. Want to learn more? Come to our info meeting (see box below). There, we will give an overview of our internship program, hear from our current intern, Ben, and answer your questions live. Learn more about the Wild! Heart Farm & Refuge internship program, and hear from our current intern, Ben, about his experience. We’ll also talk about the application process and answer any questions you bring. Please also feel free to share this email with anyone else who you think might be interested.